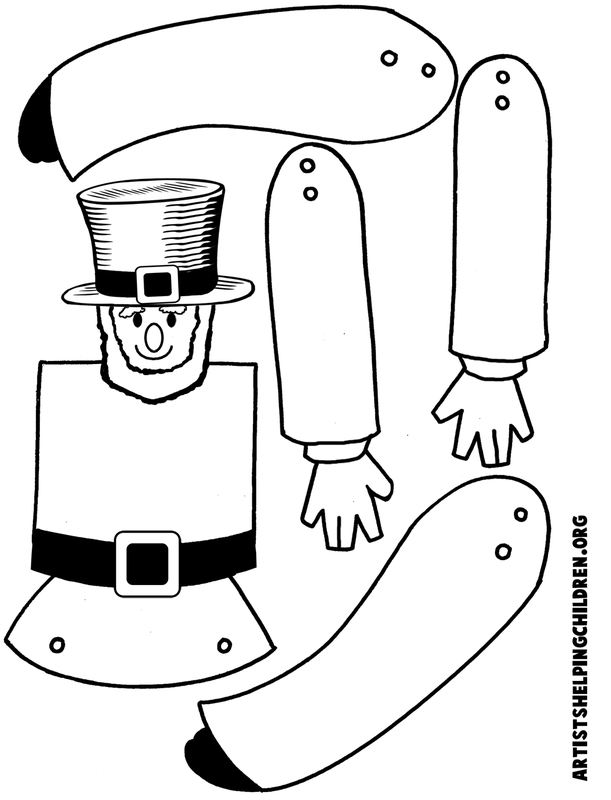 I have a fun and easy craft for you today. 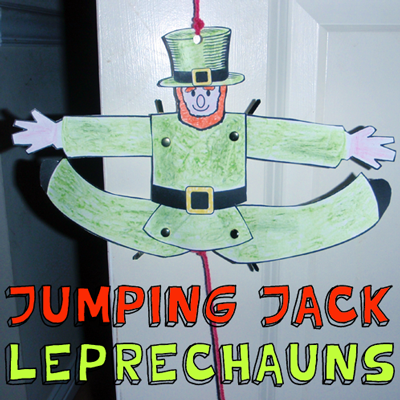 In this post I’m going to show you how to make a Jumping Jack Leprechaun for St. Patrick’s Day. 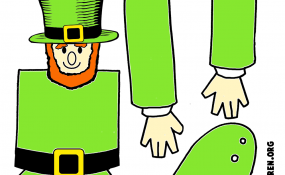 When made the way that I describe in this post the arms and legs are movable making this leprechaun actually do jumping jacks when the string is pulled. 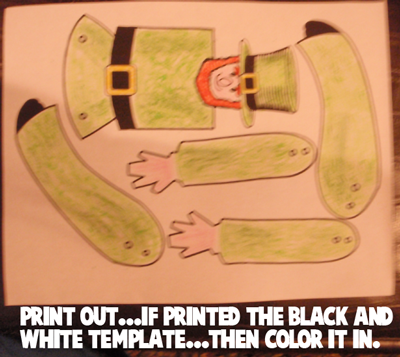 The youngest of crafters will enjoy not only making this leprechaun craft, but also playing with it once it is finished. So, grab the materials needed and let’s get started. Click on template image below to make larger and to print. Print out…. If you printed the black & white template then color it in. 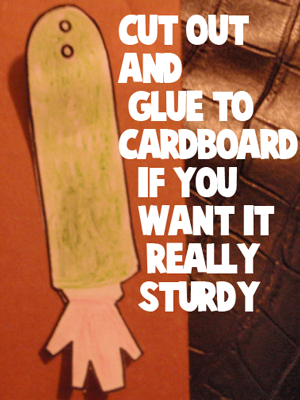 Cut out and glue to cardboard if you want it really sturdy. 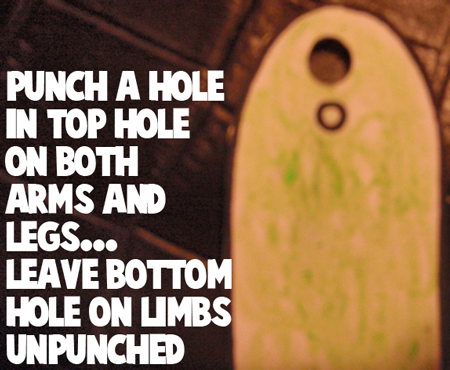 Punch a hole in top hole on both arms and legs… Leave bottom hole on limbs unpunched. 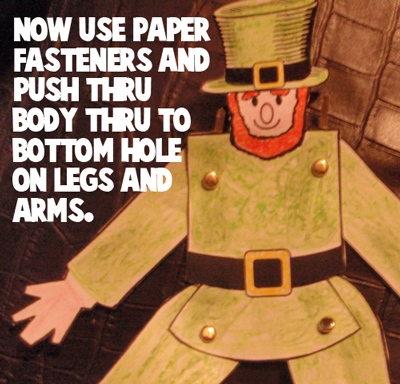 Now use paper fasteners and push thru body thru to bottom hole on legs and arms. The red circles are where the paper fasteners have been placed. 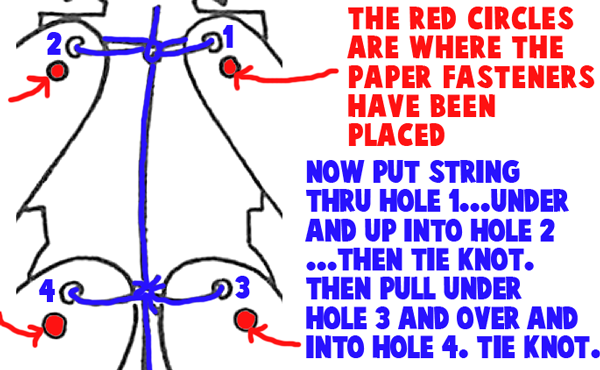 Now, put string thru hole 1…. under and up into hole 2…. 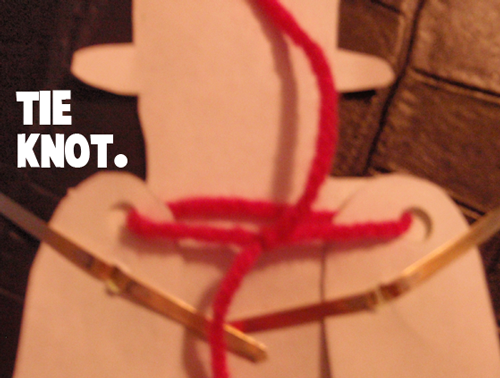 then tie knot. Then pull under hole 3 and over and into hole 4. Tie knot. 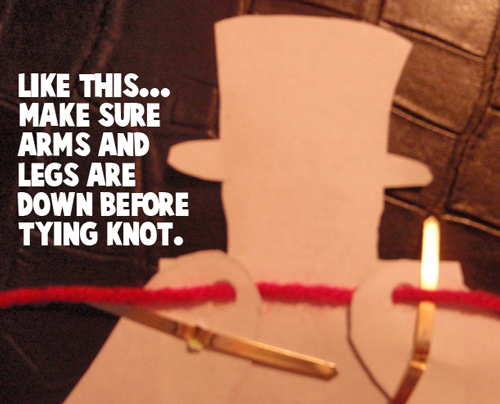 Like this… Make sure arms and legs are down before tying knot. 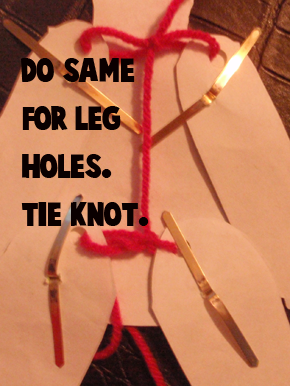 Do the same for leg holes. Tie knot. 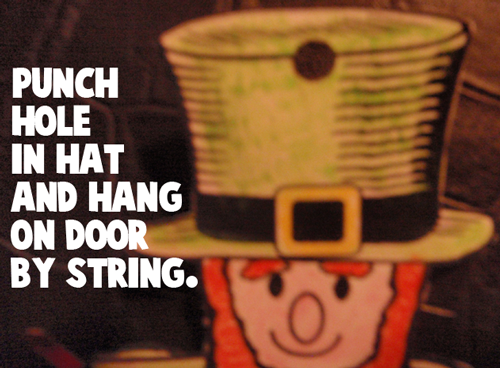 Punch hole in hat and hang on door by string. Hang it on a door knob…. 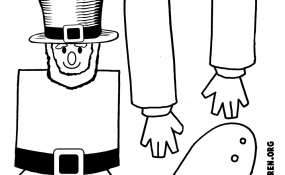 pull the string and his hands and legs pop up. And, there you go…. 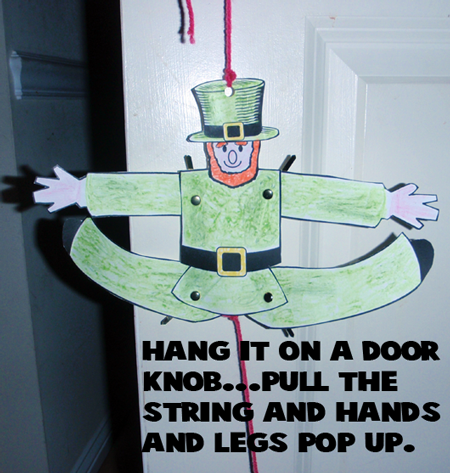 you just finished making a Jumping Jack Leprechaun for St. Patrick’s Day. 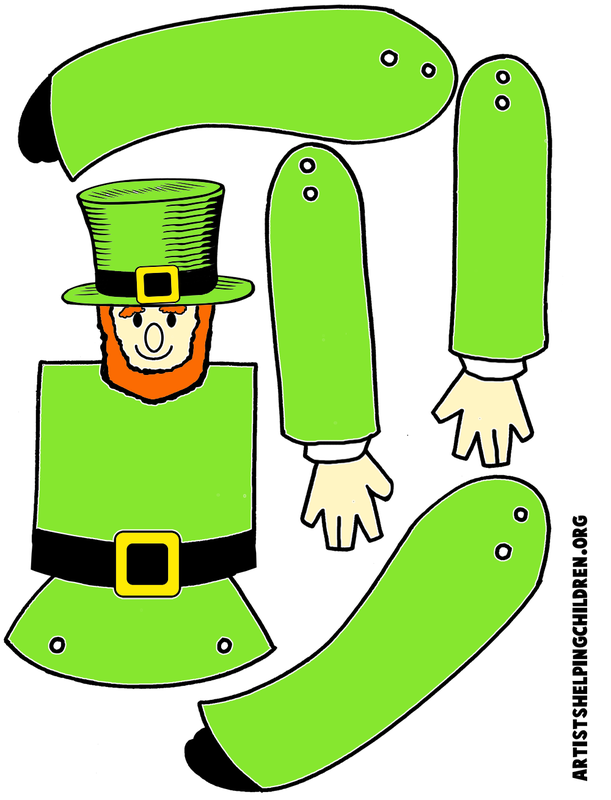 This is a wonderful decoration for St. Patrick’s Day and it is equally fun to play with. Enjoy! !